Air strikes on school in Syria's rebel-held Idlib kills 22 children and six teachers. Air strikes that hit a school in Syria's rebel-held Idlib province killed 22 children and six teachers, the UN children's agency UNICEF said Wednesday, according to AFP. "This is a tragedy. It is an outrage. And if deliberate, it is a war crime," declared UNICEF director Anthony Lake. The Syrian Observatory for Human Rights said "warplanes -- either Russia or Syrian -- carried out six strikes" in the village of Hass, including on a school complex, killing 11 schoolchildren. A photograph circulated on social media showed a child's arm, seared off above the elbow, still clutching the strap of a dusty black rucksack. Asked about the attack, Russian Ambassador Vitaly Churkin responded, "It's horrible, horrible. I hope we were not involved." "It's easy for me to say 'no' but I'm a responsible person. I need to see what our minister of defense is going to say," he told reporters. Syrian government forces and their Russian ally have been accused by Western powers and rights groups of carrying out indiscriminate attacks on civilian infrastructure. Several of those attacks have taken place in Idlib, where in August at least 10 civilians were killed in a barrage of air strikes near a hospital. In July, a maternity hospital supported by Save the Children was bombed in Idlib, causing casualties. Wednesday’s attack is the second such attack in Idlib this week. 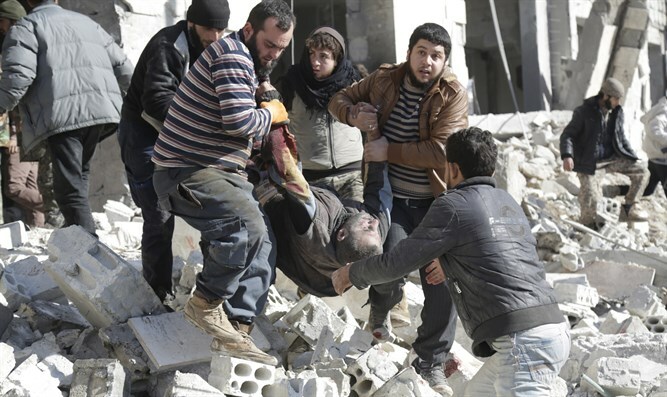 On Monday, 16 civilians, including three children, were killed in heavy bombardment across the rebel-held province. The Britain-based Observatory said those raids, too, were carried out by either Syrian or Russian aircraft.